A higher standard of eye care tailored to you. From the moment you open your eyes in the morning to the moment you close them at night, your eyes are working hard for you. Getting rubbed, staring at screens, fighting off pollution, streaming with a cold… your eyes put up with a lot. And yet, these are the eyes which greet loved ones, see nature, communicate silently, create memories, and make it easier to work, play and be entertained. Don’t your eyes deserve to be looked after by experts? Fortunately, no one works harder than Bayfields to get to know you as an individual and to take care of your hard-working eyes. You’re unique, and so are your eyes. That’s why our eye tests are so thorough, and why we listen so carefully to how you live your life. It’s why we only employ highly trained experts to help you choose your glasses and contact lenses. And it’s why we offer only the highest quality frames, lenses and contact lenses. Your eyes are precious. Make sure they get the very best care. 1. We’re in the business of transformation – Our goal is to make you feel fantastic about yourself – and the way you see, and the way you look. 2. We believe in 2-way conversation – We’ll listen to you carefully, and we’ll also explain everything and keep you informed of whatever you need to know (or would like to hear about!). 3. We’re independent – Although we’re national, we’re not a huge chain. That means we understand the importance of local relationships and the power of choice. 4. We like new things – That means the latest diagnostic equipment, the latest technological advances in contact lenses, spectacle lenses and frames, and the latest fashions. 5. We’re really thorough – Our 45-minute eye test is very comprehensive, and checks your health as well as your sight. 6. 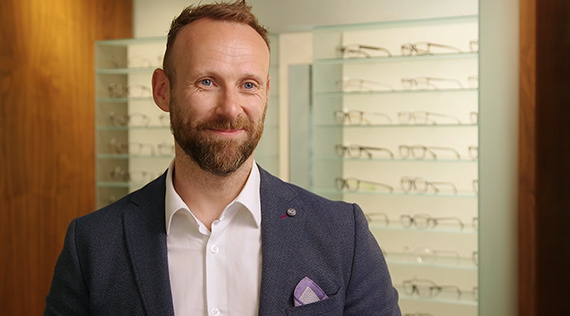 We have a good eye ourselves – We’ll work harder to help you find the frames, lenses and sunglasses which make you look amazing (even if you think most glasses don’t suit you). 7. We like a challenge – If you’ve got a strange request, or you have an eye condition or an optical variation which no other optician has been able to solve, bring it to us! 8. We understand urgency – Sometimes you just can’t wait. That’s why we can arrange emergency appointments and consultations. 9. We make it easy – We’ve got payment plans, membership plans, finance packages, postal deliveries of contact lens orders… just ask and we’ll make it easy! 10. We’ll help you switch – If you’re with another optician at the moment, you can transfer your records over to us. You don't have to do a thing other than make an appointment.